SMVDU Admission 2019 - Shri Mata Vaishno Devi University, Katra (Jammu & Kashmir) has announced admission notification for B. Arch., B. Tech., M.Sc. (Economics), MBA, MCA, M.Tech., M.Sc. and M.A. (English) and Ph.D Courses for the academic session 2019. SMVDU Entrance Examination 2019 will be conducted by the University for admission to the various UG, PG & Integrated Programs, on 27th April 2019 at various centres across the country. Online Applications can be filled at www.smvdu.ac.in till 20th April 2019. M.Tech. (Energy Systems), M.Sc. (Physics), M.Sc. (Mathematics) M.Sc. (Biotechnology) With Option for specialization in Genetics. Age Criteria: There is no age limit on the candidate appearing for SMVDUEE 2019. Date of birth as recorded in the Secondary Education Board/University certificate will only be considered. Candidate applying for admission to B.Tech Program should satisfy the eligibility criteria as per JOSAA/CSAB 2019 guidelines; however, for candidates applying for admission to B.Tech (Biotechnology) based on 10+2 Merit, having passed 10+2 (with Mathematics) with 60% is mandatory requirement. For such cases, candidates whose result has not been declared till the date of issue of Merit List for admission will not be considered for admission. Candidate applying for admission to B. Tech. program through JOSAA/CSAB 2019 must satisfy the eligibility criteria as per JOSAA/CSAB 2019 guidelines. 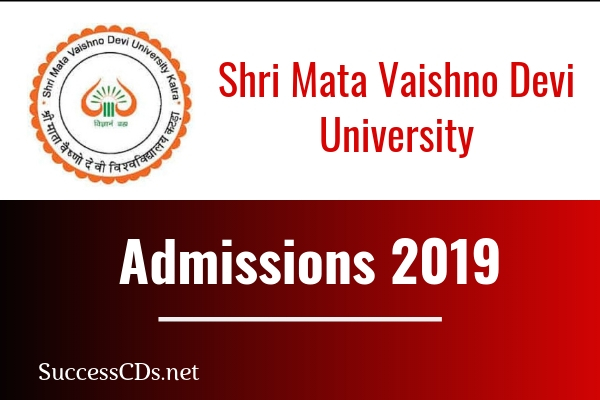 Candidates applying for admission through Shri Mata Vaishno Devi University Entrance Exam-2019 (SMVDUEE 2019) must satisfy the following eligibility criteria: a. Only those candidates who have passed their Class 12th Exam or any equivalent qualifying exam in 2017 or 2018; or those who are appearing in their Class 12th Exam or any equivalent qualifying exam in 2019 are eligible to appear in SMVDUEE (Main) 2019, irrespective of their age. Candidate applying for admission to B. Arch program through JOSAA/CSAB should satisfy the eligibility criteria as per JOSAA/CSAB 2019 guidelines and Council of Architecture (CoA) guidelines. Further, candidates having valid NATA 2019 Score and having minimum aggregate percentage at 10+2 of at-least 60% or equivalent CGPA and having obtained at-least 60% aggregate in Physics, Chemistry & Mathematic will also be eligible. PG Programs M.Tech. / M.Sc. / M.A. /M.B.A. A candidate for admission to Ph.D. program on Full-Time Registration Basis must have obtained Master's Degree in Engineering/ Technology/ Sciences/ Management/ Humanities & Social Sciences or in interdisciplinary/ trans-disciplinary discipline with minimum CGPA of 6.75 on a ten point scale in relative grading system or minimum CGPA of 6.00 in absolute grading system or 60% marks in aggregate of any University established by law (In order to encourage interdisciplinary research, the SRC may also exercise desired flexibility w.r.t. the qualifying degree of the applicant(s) as found suitable.) or an equivalent degree from a foreign educational Institution accredited by an Assessment and Accreditation Agency which is approved, recognized or authorized by an authority, established or incorporated under a law in its home country or any other statutory authority in that country for the purpose of assessing, accrediting or assuring quality and standards of educational institutions. Through JOSAA/CSAB: The admission will be based on All India Rank (CRL) as secured by a candidate in JEE (Main) - 2019. The counselling for admissions and subsequent allotment of seats shall be done by JOSAA/CSAB. For detailed eligibility conditions please refer www.jeemain.nic.in and www.csab.nic.in / www.josaa.nic.in. The candidate will be required to undertake the Written Test. The Written Test of candidates being conducted for admission to PhD Program shall be treated as a qualifying criterion (screening test) for proceeding to the Interview process. The cut-off marks to be kept for passing the Written Test may be decided by the concerned Dept. Research Committee keeping in view the nature of difficulty level of Written Test and related considerations like vacancy position, number of applicants etc. 5% Seats are reserved for Persons with disabilities under Equal opportunities, Protection of rights & Full participation) Act, 1995. Details can be obtained from Admission Office. The online submission of particulars, uploading of scanned photograph and signatures may be made at SMVDUEE 2019 website. The candidates should supply all the required details while filling up the online form. On submission of details, Acknowledgement Page with Application No. shall be generated. Before filling up the application form the candidate should have a scanned image of his/her photograph, signature and father’s/mother’s/guardian’s signature. These scanned images are to be uploaded during the submission of application form. The photograph should be colour or b/w (but clear contrast) with name of the candidate and date of taking the photograph printed on it as shown below. It should be without cap or goggles. Spectacles are allowed. Polaroid photos are not acceptable. Candidates with unclear photograph are liable to be rejected. Candidates may keep 6-8 identical photographs in reserve for use at the time of entrance examination, Seat Allocation Process and Admission. The Admit Card can be downloaded from SMVDUEE 2019 website from 21st April 2019 onwards. The Candidates are also advised to regularly see SMVDUEE 2019 website (www.smvdu.ac.in) for updates. A Help Desk will also be functional on all working days from 10.00 AM to 4.00 PM for general facilitation.